A great event takes place every Monday called Monday Night Super Club. Headed up by Dan Clapson and mostly organized via Twitter (#MNSCyyc), it was born after the latest season of Top Chef Canada finished, ending the weekly Monday night viewings a group of foodies had been attending at Charcut (Connie De Sousa, executive chef at Charcut, made it to the top 3). The club alternates going to a Calgary restaurant one week then having a potluck the next week. Last Monday’s MNSC – my first supper – was held at Anju Restaurant. It was AH-MAZING! Here’s Dan’s recap of the evening. This week being potluck week, everyone brought something and we met up at Sandy Beach. I must admit, I was a little nervous about what to make for a discerning group of foodies even after I found out we were meeting in a park. 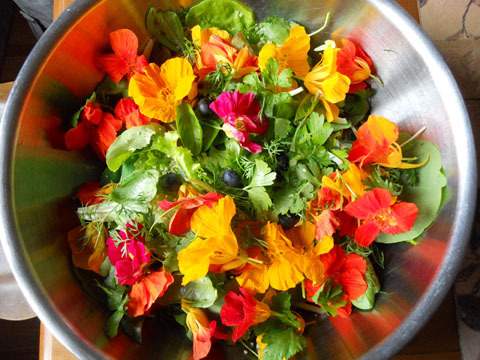 In the end I chose to make something super simple – a fresh green salad with edible flowers. 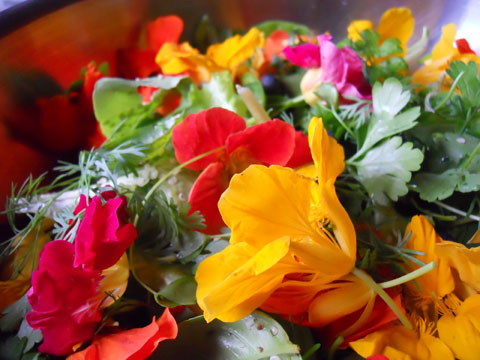 It turned out beautifully and really wowed the group, especially when they found out most of the ingredients were from my garden. The variety and creativity of the food everyone brought was excellent. We ended up with quite the spread – definitely the best potluck I’ve ever been to! Toss ingredients in a large bowl. Add dressing just before serving or serve on the side. This looks so pretty. I just made the salad dressing. I make a similar dressing, but this recipe added honey and apple cider vinegar. It kicked up the flavour a bit. Thanks for sharing! Thanks Rachel! Happy you liked it.